Understanding and nurturing your soul’s powers and needs is the key to transformation and making your ideals real. Your soul has its drives, wisdom, emotions and powers. Allow me to help you discover solutions for your daily dilemmas by discovering your soul’s potential. This is done in our courses with the wealth of information presented from the teachings of the Baal Shem Tov about the soul. 1. Your thinking and emotional patterns and behaviors. 2. Having compassion for people’s mindsets. 3. Understanding how your mindsets affect your life and how people respond to you. 4. How you can you can respond with a higher consciousness. The Spiritual Consulting and Coaching Course is an innovative program which gives you an opportunity for you to be coached and enrich your life. You will practice helping yourself and learn how to help others develop the skills of self-reflection, prioritization, inspiration and integration. The course is presented in a warm and intimate setting with women of similar mindsets and soul aspirations. Looking forward to greeting you. I am also excited to be offering personal Baal Shem Tov Therapy in a private setting. Mrs. Yehudit Eichenblatt received a teaching certification from Bais Rivkah Seminary in Israel and from the Israel Ministry of Education. She studied with the foremost Chassidic teachers of our generation and received multiple blessings from the Lubavitcher Rebbe to found and enhance Bais Chana of California Women's Yeshiva. ​Driven to support women to live a productive, holy and meaningful life, she creates innovative courses and provides Chassidic Therapy which helps people understand and change their internal life. She creatively incorporates coaching skills with Chassidic Therapy for people to shine their essence. "The seminar is good, it is good way to take all the knowledge from Chassidus and integrate it into our lives. The coaching questions we were given in the seminar are a good way to make positive ideas part of our everyday life." "I have been taking the spiritual consulting and coaching course with Yehudit Eichenblatt for three years. We learn Torah in a way that relates to life improvement. 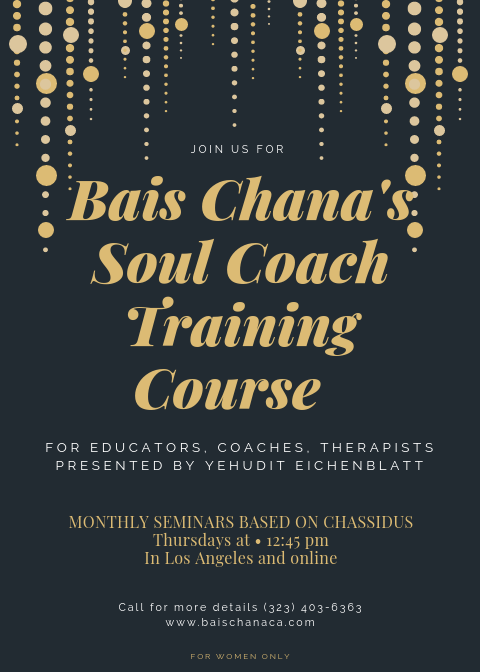 The course teaches practical application of Chassidus in our relationships, time management, and feelings. Yehudit is knowledgeable, she has studied Chassidus for many years. She has a solid structure which makes it easier to zoom in on things we are not even aware of. She utilizes very esoteric ideas for practical application. We studied these esoteric ideas and we keep learning them so that when new situations arise in life we know how to overcome the challenges. I am a psychotherapist so I can say that the Spiritual Consultant and Coach Course is more than a therapy group. The reason is because it is not just about 'me,' I learn to connect to something beyond myself. The course teaches us how to connect to our soul and its Sefiros (n1anifestations). This connects us to G-d. It opens us to some thing inside ourselves that is larger and higher. With Yehudit's guidance, I have a chance to work on things in myself and connect to something higher so I have extra abilities to give to others .... Even when I am tired and I push myself to go to the Seminars I feel energized afterwards .... Thank you for all the wonderful Bais Chana classes I can go to."